Running an ecommerce site sounds easier than it actually is. Getting the visitors to the site to convert is even harder. However, it is not impossible. There are various factors that affect the conversion rates of such a site. As a result, it can be difficult to understand where to bring about improvements to increase the rates. In order to make things simpler for you, here are some easy tips that can be implemented quickly for increasing your conversions. You should use images of a high quality. Use action shots wherever possible. They should be large enough to be easily viewable. The alignment should be suitable. Implement a zoom option wherever possible. The images are necessary for the customers to make their choice. Videos are a great way to boost conversion. 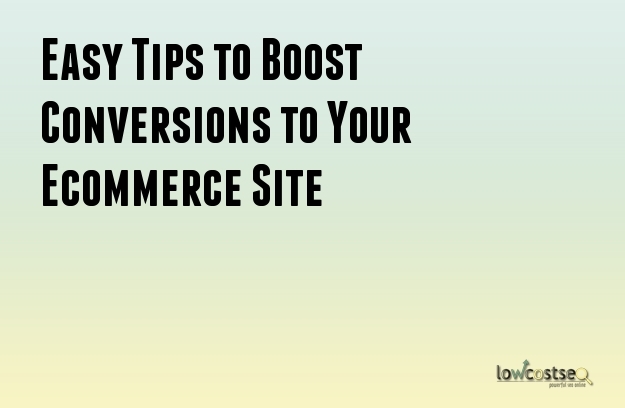 In fact, they can increase conversions by almost 80%. Users also enjoy watching the videos. Up to 85% of users are influenced to purchase the product after watching a video. Colors can significantly affect the conversion rates. Almost 85% of people are influenced by colors when it comes to shopping. By using the right color scheme you can attract the following three kinds of shoppers. You should not underestimate the importance of colors. They are capable of increasing the conversion rates by 10%. More importantly 60% of shoppers will read the reviews and base their purchasing decisions on them. Therefore, display all reviews but maintain a ratio between the good and the bad ones. For every bad review, there should 9 positive ones. Few things can motivate shoppers as urgency. When you offer limited quantities of your product, people will be more likely to buy them as the product becomes automatically more valuable in their eyes. Other options include offering limited time offers, free delivery for products ordered during a limited period of time and special shopping hours. You need to make it easy for the visitors to trust you if you want them to purchase your products. One way to increase the trust is by displaying the seals and badges from the different security corporations. For example, if you are offering PayPal as a payment option, you should get your site verified by PayPal. This will allow you to place a badge showing the PayPal verification on your website. These badges can increase conversion by 40%. You should make it easy for the customers to complete their purchase and checkout process. Many shopping carts are abandoned because the customer found this process to be too cumbersome. In order to make the checkout process smoother, you should isolate it from the other processes and free it from clutter. Use a single page for it and ensure the presence of a proper hierarchy. The whole process should be editable so that the customer can make changes as required. Make sure field validation and errors are enabled so that thee customer does not end up making mistakes accidentally.